Butter London AW/2010 – OMG Look! It’s Marrow! I’m so freaking excited to see Marrow put in an appearance! It was custom mixed for Vena Cava back in February and here it is, hitting the main stage! Four striking new shades to challenge and tempt our purses, a real mix with something to please everyone. All Hail McQueen – An opaque, holographic beige. Bumster – An opaque, ochre yellow. Marrow – A dark, flat, murky & mysterious purple. Victoriana – A textured, twinkling vintage blue. Ugh… Frankly, I’m drooling at the description of All Hail McQueen too… this collection is gonna be a sell out. I can see Bumster looking particularly amazing on dark skin tones and twinkling vintage blue…. vintage blue? *dies*. I used to have a colour which looks like Bumster, it was the best gold I had ever used, I think it was by 17..applied like satin. I think I’d layer All Hai McQueen over Bumster if it was sheer enough. And am I the only one giggling at the word Bumster? ‘Bumster’??? Who on earth thought that one up!? Whatever they were on at the time, I also want some! Ha ha ha ha ha!!!!!!!! Those are some fun colors! Wow, these all look beautiful! McQueen and V for me. Bumster too if it applies well. I love Butter London. Rosie Lee is an all-time fave. Despite the name, I totally love the look of Bumster!! I cannot wait to see swatches of Victoriana. It sounds amazing. Wow! Thank You so much for this great piece and hilarious comments! BUMSTER DEFINITION: Designed by Alexander McQueen in 1996, these perilously low-slung trousers shocked the fashion world, by exposing one’s bum crack. Victoriana and All Hail McQueen look STUNNING. These look awesome! I like Marrow and Victoriana! 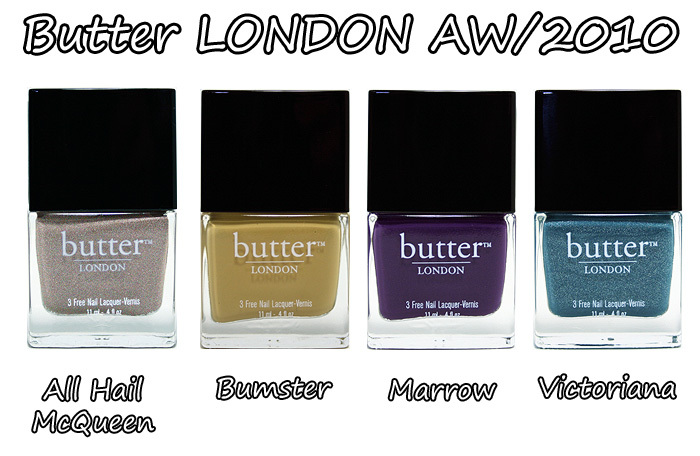 I think I may need all of these… wish butter london was easier to get stateside.